We’d love your help. Let us know what’s wrong with this preview of Complexity and Organizational Reality by Ralph D. Stacey. Approaches to leadership and management are still dominated by prescriptions – usually claimed as scientific – for top executives to choose the future direction of their organization. The global financial recession and the collapse of investment capitalism (surely not planned by anyone) make it quite clear that top executives are simply not able to choose future directions. Despite this, current management literature mostly continues to avoid the obvious – management’s inability to predict or control what will happen in the future. The key question now must be how we are to think about management if we take the uncertainty of organizational life seriously. 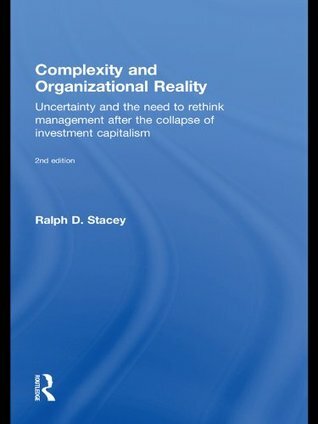 Ralph Stacey has turned to the sciences of uncertainty and complexity to develop an understanding of leadership and management as the ordinary politics of daily organizational life. In presenting organizations as a series of complex responsive processes, Stacey’s new book helps us to see organizational reality for what it actually is – human beings engaged in many, many local conversational interactions and power relations in which they negotiate their ideologically based choices. Organizational continuity and change emerge unpredictably, rather than as a result of any overall plan. This is a radically different picture from the one painted by most of the management literature, which explains "organizational continuity and change" as the realization of the global plans and choices of a few powerful executives within an organization. Providing a new foundation for understanding complexity and management, this important book is required reading for managers and leaders wanting to understand the reality of complexity in organizations, including those engaged in postgraduate studies in leadership, organizational behaviour and change management. To ask other readers questions about Complexity and Organizational Reality, please sign up. Very interesting book but very hard to read. It is complicated and I lack the pragmatic view. "Great ideas and theory, but how does it help me?" "Dit boek geeft een interessante kijk ook in de tijd gezien hoe om te gaan met besluitvorming in complexe omgevingen. De voorspellende waarde neemt af en toch wil je sturing geven aan de organisatie en de voorspellende waarde van besluitvorming zoveel mogelijk borgen. " Amazing thinking. A bit hard to read, but worth it.